Kudos to Carmela Mindel, my first mentor, for securing funding from Victor Bertrand Sr. of Mega Brands for the Free Therapy Program at the Argyle Institute of Human Relations. This program benefits people with dependents who live below the poverty line, offering them therapy and counselling. Janet Torge wrote an interesting article: “Depression: An inevitable malaise for aging women?” which summed up the “cure” as exercise and good nutrition (what have I been telling you? ), to enable you to live for seven more years. So, this blog promotes increased longevity. The secret to this chicken stock is….cooking it for at least seven hours. My sister Julia’s instructions. That way the bones just about disintegrate, every bit of flavour is released from all the ingredients and your stock will be wonderfully rich and semi solidly gelatinous. Keep celery tops, parsley and dill bottoms, aging parsley or dill, raw or cooked chicken bones in a bag, in your freezer, ready when you are. Mix all ingredients in the pot. Bring to a boil, then simmer partially covered, with a small opening to let the steam escape, for seven hours, stirring occasionally. Strain to remove cooked veggies and bones, keeping some onions, celery, carrots and parsnips to eat or cut up into the soup, if you like the taste of them (I do). 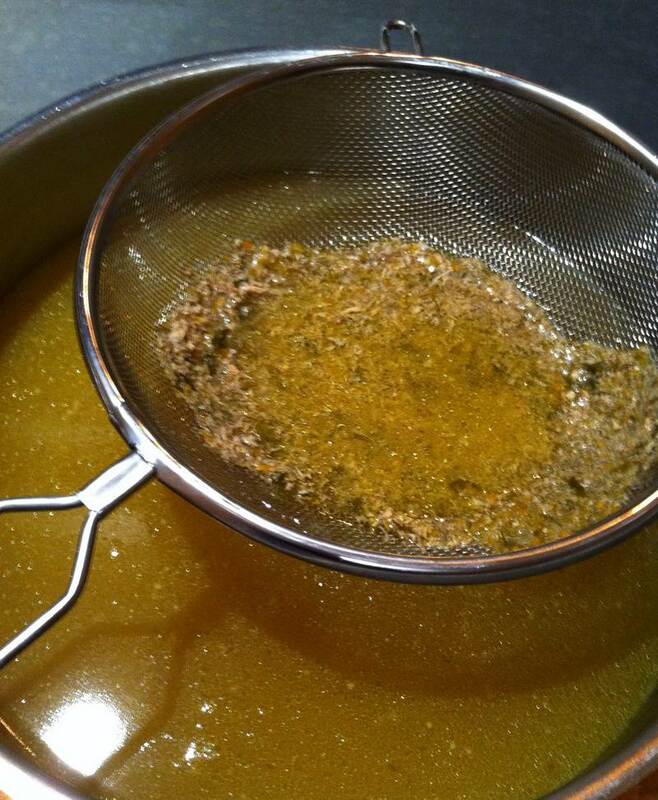 Strain again with a medium fine mesh strainer to remove sediment. Cool on countertop, refrigerate until fat rises and congeals, then remove fat before consuming. 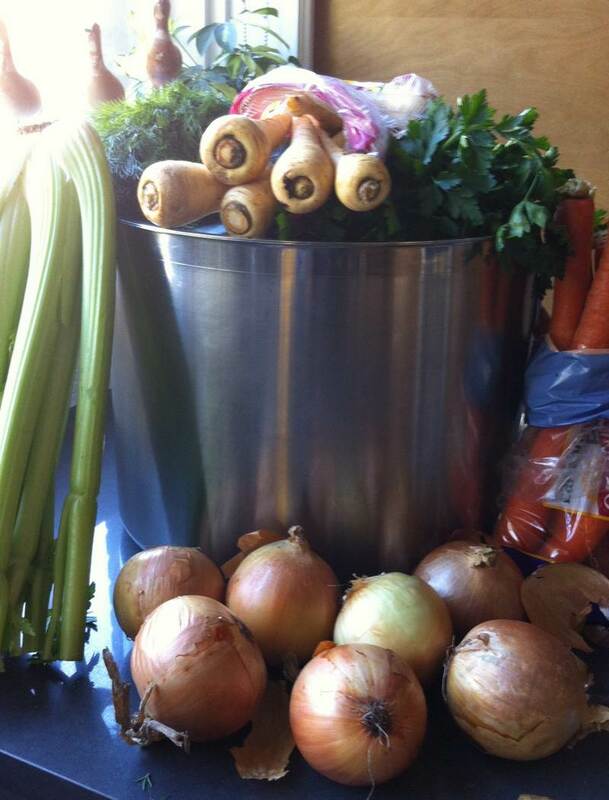 If you freeze the soup before removing the fat, it can easily be removed after thawing, before heating. 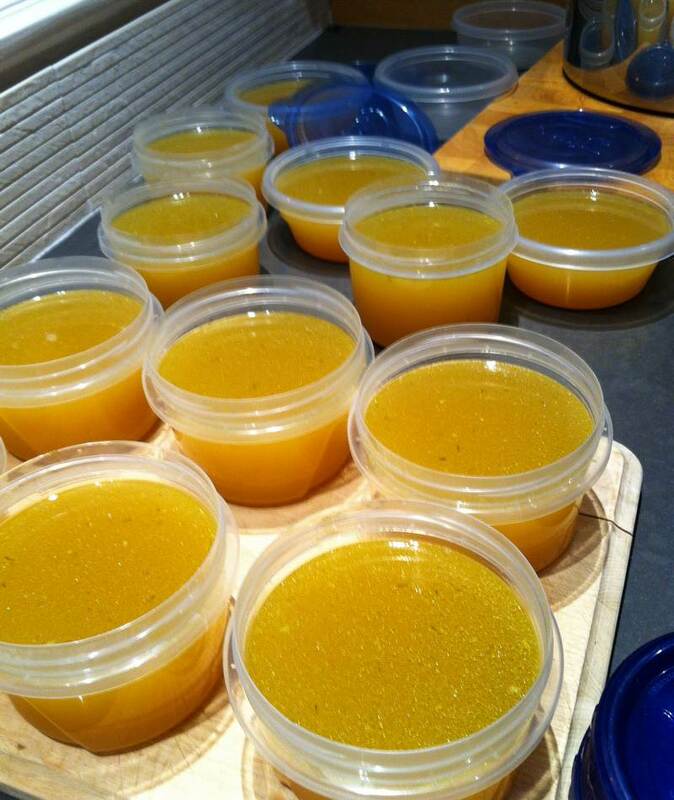 This recipe produced 28 cups of golden stock. You can either serve an army, or freeze in 1 or 2 cup containers. A frozen container can be thrown into your lunch bag; a soothing broth to get you through the day. 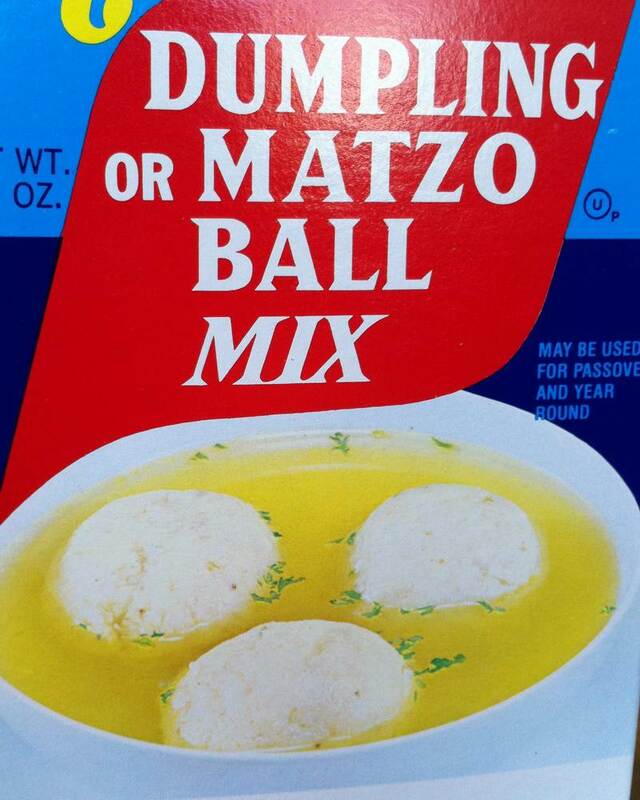 Matzoh balls can be made according to the directions on the package for a complete cure of whatever ails you. Add some finely chopped fresh dill before serving. My 24 L thick bottomed stockpot is a Thermalloy by Browne Halco, purchased on the west side of St Laurent St., at the corner of Beaubien. My huge medium fine mesh strainer is from there as well. Check out this blog Zen Habits; The Cure for What Ails You. If you make Jittery Cook chicken soup, you can save all the well cooked chicken, carrot, celery, onion, dill, parsnip and parsley to make these Chicken Soup Burgers. Carefully remove all the bones. Mash everything together using your hands. Add in some cut up left over cooked potato, 2 eggs and a little salt and pepper. 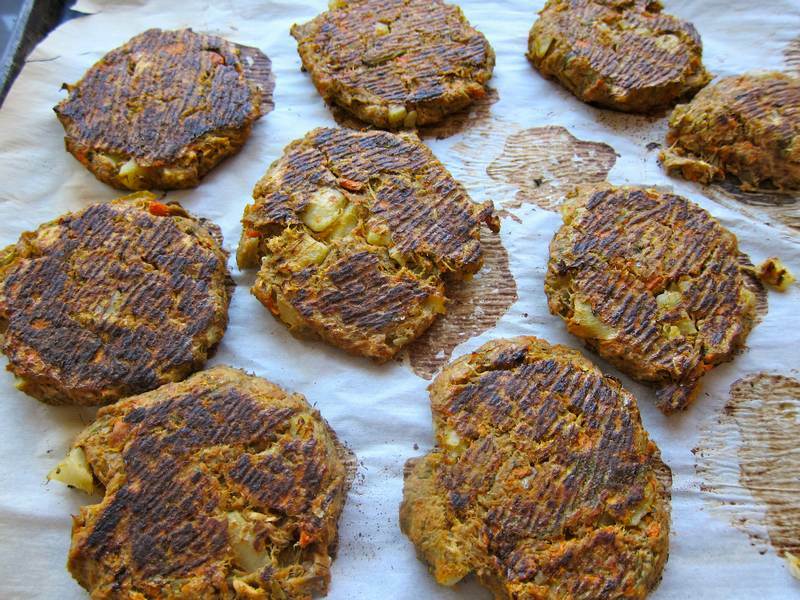 Form into patties and roast in a 400F oven for 20-25 minutes, flipping at half time. Serve with ketchup. That soup looks so good right about now. I have come down with a nasty head cold. Rest, make chicken soup, feel better!!! harden. What are your thoughts about these differences? Both good to do. I tend to ignore the skimming though. The skimming really makes the soup “clean” of the fat! Well….on second thought, I knew you had said you remove the fat!! You say you ignore the skimming but reading later I see you do address removing the fat after cooled in the fridge, so you are getting it all anyways!